In its former life it may have housed a sweetly trilling, yellow canary. Perhaps a small, colorful parakeet. Maybe it housed a talking bird with an extensive vocabulary. Great for entertainment! 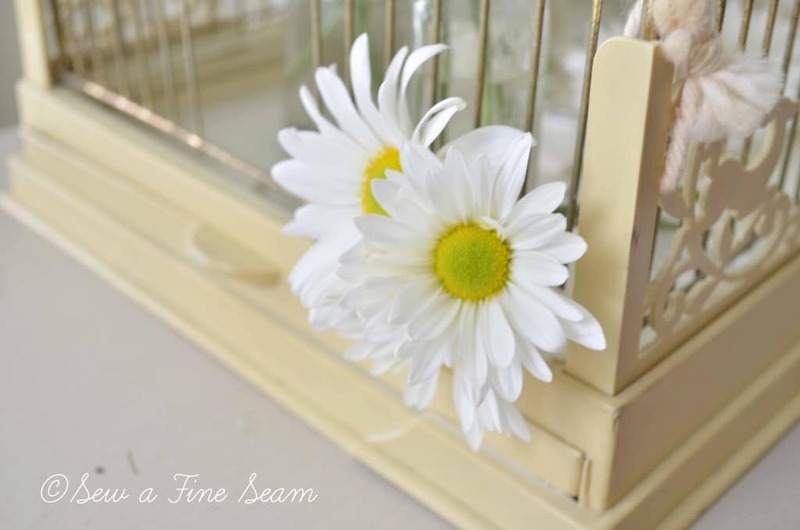 Whatever it housed in its former life, for now this delightful, vintage bird house is a home to some daisys. 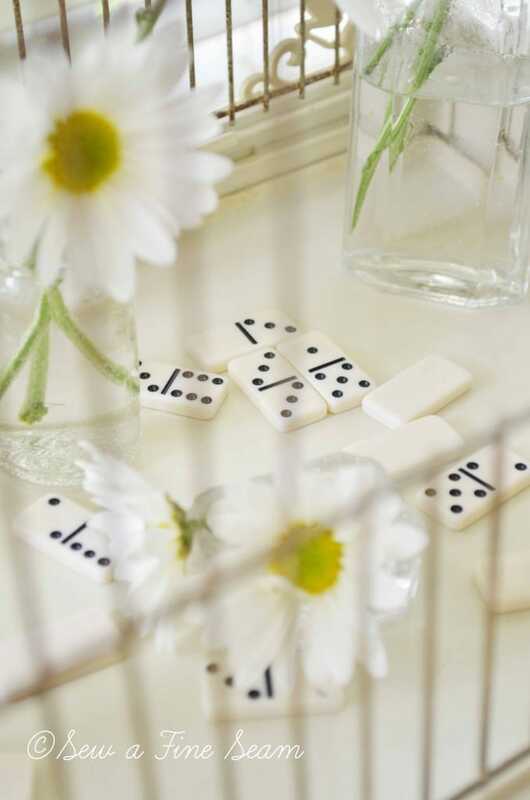 And some miniature dominoes. 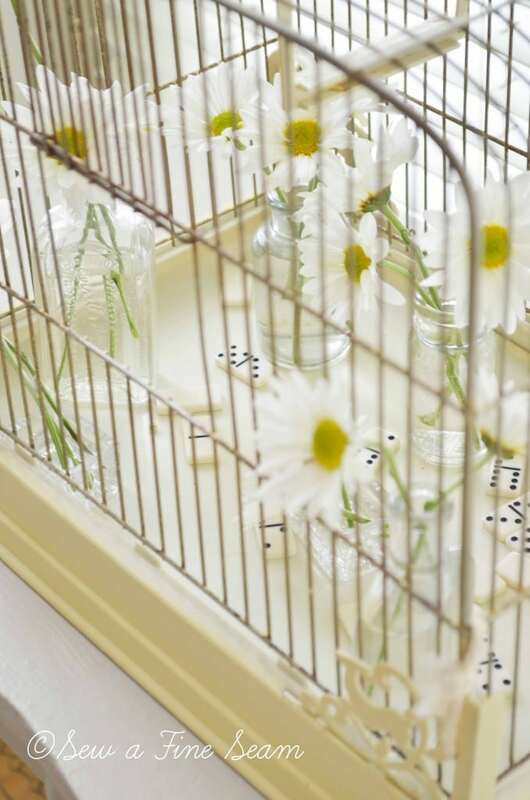 And vintage glass bottles to hold the daisys. This vintage bird house was one of the finds I came home with the weekend my little town had their city-wide garage sales. You can read about my finds here. 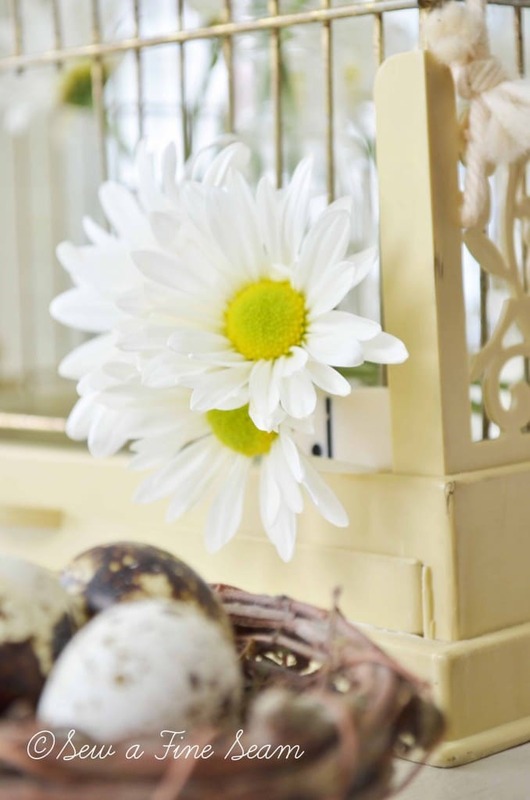 Lucy from Craftberry Bush did a Spring flower arrangement in a bird cage and I loved it. So that was the first thing I did with my birdcage. I still want to do this again with some really long stemmed flowers like Lucy did but this worked for now. 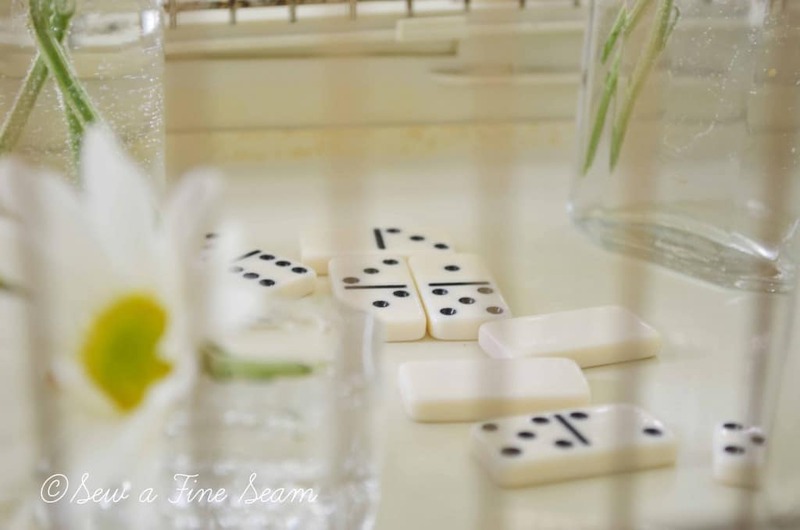 The mini dominoes I’ve had for a couple years and I thought they would be fun sprinkled on the floor of the cage. Just a bit of whimsy to keep it interesting. 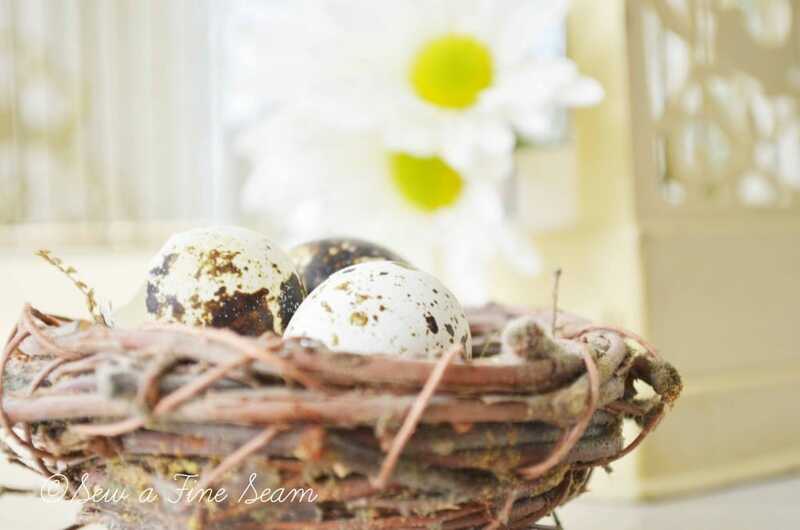 Of course a nest with some eggs always goes well with a birdcage – no?! 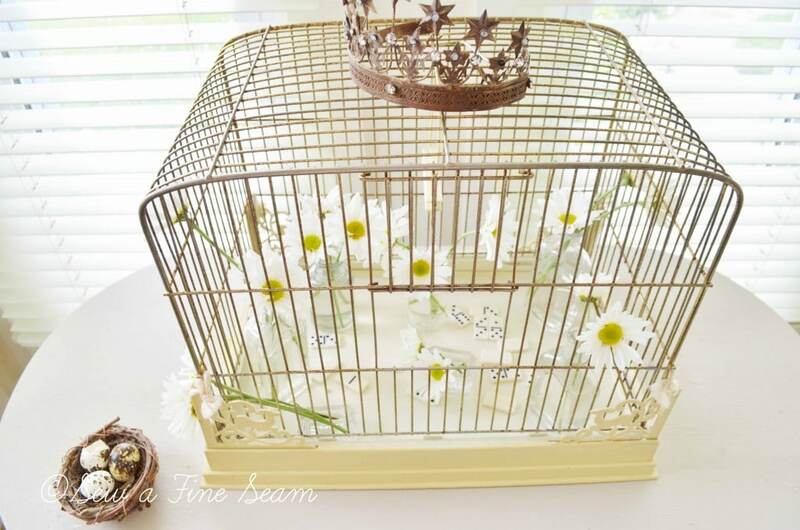 My girls would like it if we bought a real live bird to live in this adorable bird cage. Unfortunately for them their Mother has a pretty firm ‘NO-animals-in-the-house’ rule. 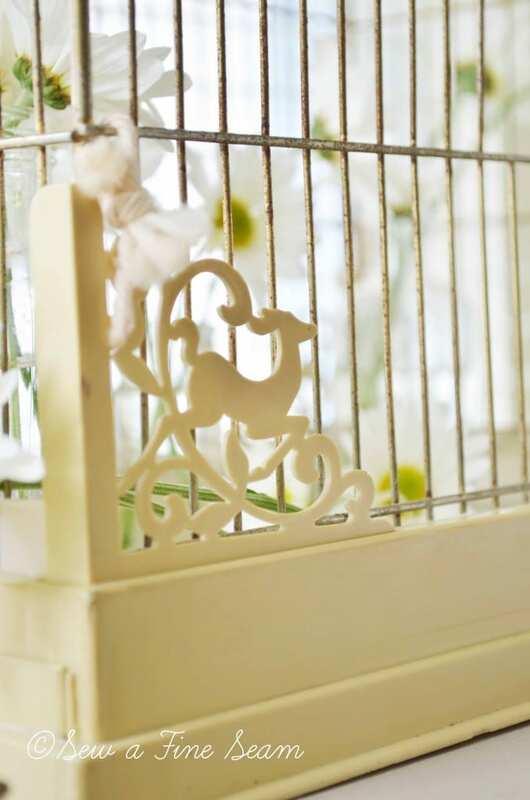 A cute birdcage doesn’t stay cute with a real live bird in it – yes that is my opinion, but in this household it’s gonna be a fact. The little salt cellar is one of several I bought at the auction of my Grandma’s things. I think the bird cage is happy with its new life. It sits quietly, daintily showing off in the sunshine that streams through the nook windows each morning. On cloudy, gray days it brightens the space with its own quiet loveliness. It quite gives the room a fresh look for summer! My teenager leaves tonight to go with the Youth Group to ALIVE! It’s a 5 day Christian concert and she is rather excited. She has packed her stuff more times than I kept track of and keeps remembering stuff on the list she hasn’t rounded up yet. Oh the memories it brings back. I’ve said it before and I’ll say it again – You WILL relive your teen years – through your kids. Yes, it’s a bit different being in the parents seat but it brings back all those feelings and emotions you though you were done with forever! Yes you could have painted it! But I totally get the ‘time to get rid of stuff’ mentality. I do that after every garage sale too. There is only so much junk you can keep! I love the whole look! So pretty! 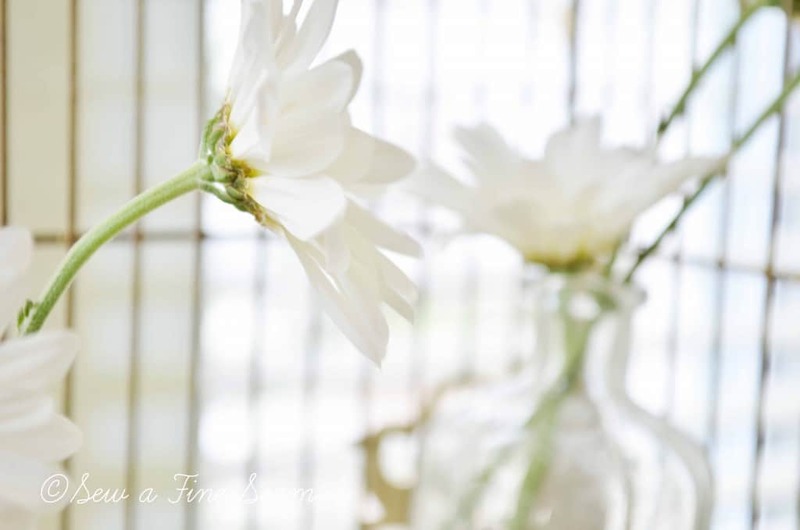 Flowers in glass bottles just have an aura! Happy travels to Emma! Hope her trip is terrific! How can she be old enough?!!! Sigh. I don’t know how she got old enough for this. I turned around one day and there she was. It’s such a pretty and unique bird cage, I would have grabbed it up too. You’ve styled it beautifully Jill. Safe travels to your daughter! And yes, you’re so right about reliving your teenage years…which can be both good and bad…for both parents and kids!! Isn’t it a fun one Debbie?! I’m so glad I got it. Refluffing the house helps with the stress level of ‘reliving those teen years’!! LOVE, I am not a huge fan of birds so I’d much rather flowers. Oh! Small one adores her pants. So glad she loves her pants! Those are a fun color! My youngest has a pair from a couple years ago that she still loves – they are the yellow and white. They are barely below her knee now and they have a hole in one leg but she still wears them. Silly thing is I have more fabric and I just need to take a few minutes to make her a new pair! Love the birdcage. I have one hiding in my attic which is gonna see the light of day again. I collect little salt cellars and have one just like yours. Don’t you just love it. I occasionally get mine down and use them on my table. I even found some tiny salt spoons on eBay. Thanks for the birdcage idea. Oh Good Regena – get that thing out! it will be like Christmas and you can rearrange your whole house around it – 🙂 I love salt cellars – I want to use them in a tablescape soon. You are so right about reliving the teen years through your kids! I have a 19 yr old and did that very thing while he was in school and now as a young adult planning his future. It keeps us nostalgic and makes me feel old. That part I don’t care for so much! I love your birdcage! I once had an old round one on a stand that I found at a flea market/antique mall. Unfortunately, I don’t have it anymore. I went through a different decorating phase where I was no longer using it. I love the look of yours with the flowers in it. I had a bird cage years ago that I eventually sold. It was taller and just didn’t fit very many places in my house. Funny how our decor changes and evolves! I’ve sold things I later wished I hadn’t and kept things I wonder later why I still have it! and I’m not liking the feeling old either – seems in some ways it should still be me going out with friends! So sweet and your photographs are AMAZING!!! Hope your little on has a great time at camp…those were fun days!!! Thanks Cindy, I had fun with this 🙂 My daughter was super excited when I dropped her off tonight. Praying they have a wonderful time and stay safe. That is the cutest idea. Thanks for sharing, your pictures always brighten my day. What beautiful pictures. 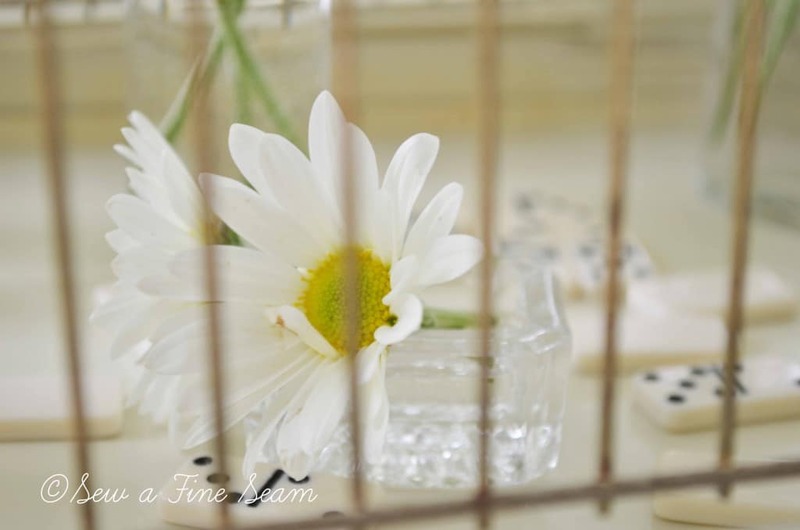 I couldn’t agree more, you sweet little vintage bird cage looks much better (and cleaner) with flowers and dominoes inside than a bird. I hope your daughter enjoys her 5 day adventure! Lovely! 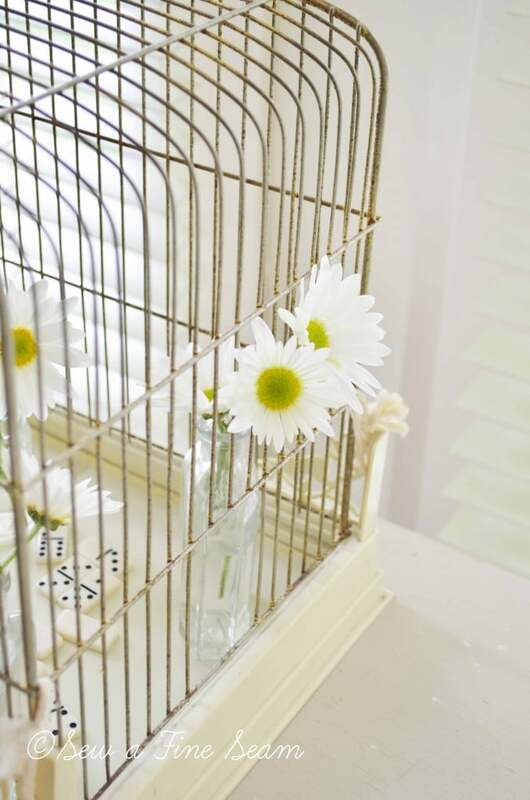 I love the use of birdcages in home decor. Have a great week! Thanks Leslie! 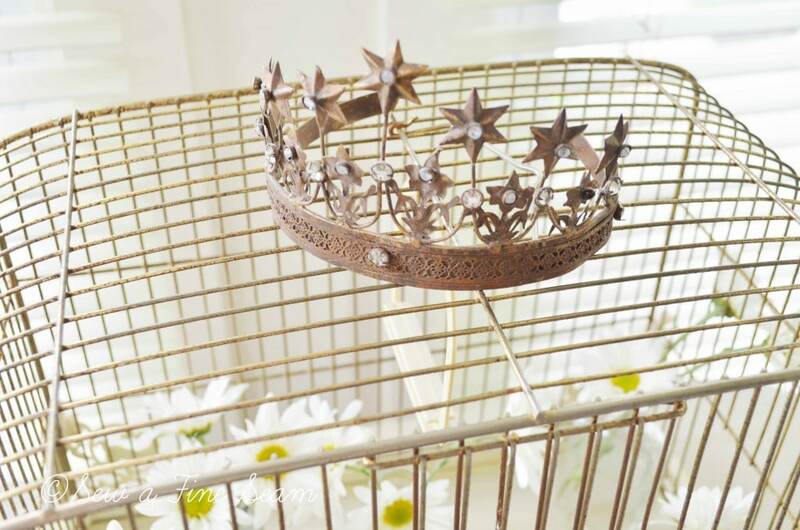 I am really enjoying having this birdcage. I had one several years ago but it was a lot taller and I ended up storing it for a couple years and then sold it. It wasn’t a good size and shape for my house. This one works in great! 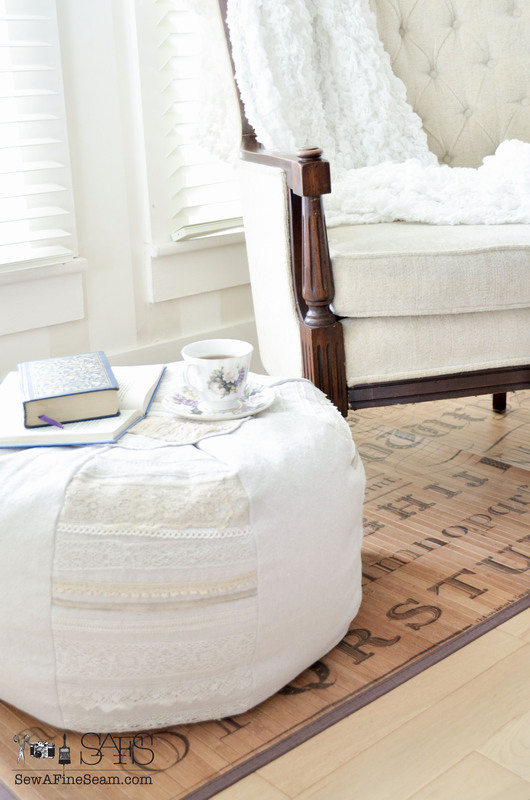 This looks so sweet and charming! Just love it! It’s so much fun to do something unexpected with things!! Hope all is well with you! Lots of changes here, but it is all good. Thanks Becky! I’ve not been by for a bit – my time has been a little busy lately! I’ll have to catch up soon! This post makes me feel SO happy. 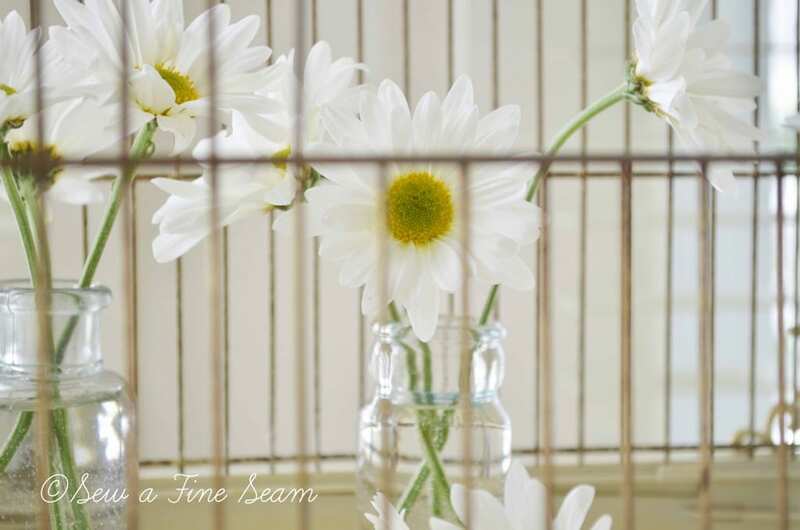 Seriously Jill, its such a bright, cheery bird cage and the daisies look perfect in it. How you come up with such wonderful ideas I don’t know. I love your taste. 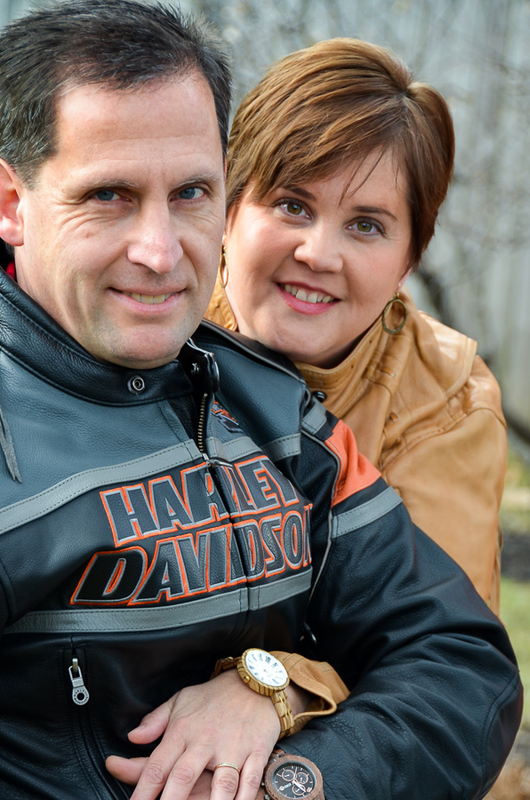 Thank you Leslie – it makes me happy to look at it!